According to reports from the National Institute on Drug Abuse (NIDA), Spice and K2 are older names for drugs classified as synthetic cannabinoids. These synthetic cannabinoids are not one singular type of chemical substance; they include numerous different chemical substances that are synthetically madeand typically inhaled in e-cigarettes, vaped, or smoked like marijuana. Although the group of drugs is classified as synthetic cannabinoids, they are only vaguely chemically related to cannabis products, and they are often far more dangerous. They have been marketed on the Internet and sold in convenience stores and gas stations as legal alternatives to marijuana; however, the drugs are not safe or often legal. These different drugs are often manufactured overseas in countries like Pakistan, China, and India where very little supervision and consistency go into the manufacturing process. Due to numerous poisoning issues and other problems associated with use of these drugs, the United States Drug Enforcement Administration (DEA) moved to swiftly classify many of these chemical formulations in the Schedule I category. Unfortunately, manufacturers would simply alter the chemical formula slightly once a particular formula was deemed to be an illegal controlled substance, and this kept the drugs on the street. Eventually, the DEA was able to list different synthetic combinations as illicit drugs, making it harder for the manufacturers of these drugs to legally import them. The drugs were initially targeted at younger individuals in an attempt to take advantage of the market for that group. Due to very good controls in many of the southern states as well as marketing campaigns targeted at the dangers of the drugs, use by younger people has declined significantly since the earlier part of the 2000s. Because the substances are synthetic drugs that are manufactured without supervision, there can be little consistency from batch to batch or product to product in terms of ingredients. Numerous publicized cases of poisoning as a result of use of synthetic cannabinoids have reported in the media. These drugs tend to be very powerful and have mixed effects that are hallucinogenic, stimulating, and dissociative. They are associated with the development of physical dependence if used consistently. The groups that appear most vulnerable to using these extremely dangerous drugs are homeless individuals and prison inmates who are unable to procure cannabis, as they can easily and cheaply purchase these products. The initial concern with synthetic cannabinoids is that they were marketed primarily for younger individuals. Data presented by the United Nations Office of Drugs and Crime has indicated that between 2006 and 2015, there was a steady market for synthetic cannabinoids worldwide. Trends indicate that use of these drugs declined for children and adolescents worldwide over this time period, but increases were observed in homeless individuals and prison inmates. NIDA has presented data regarding the use of synthetic cannabinoids in younger individuals in 8th grade, 10th grade, and 12th grade. The trend indicates a decreasing rate of use of the substances in these three groups from 2014 through 2017. For 8th graders, the percentage of individuals reporting use of synthetic cannabinoids was 3.3 percent in 2014, 3.1 percent in 2015, 2.7 percent in 2016, and 2 percent in 2017. For 10th graders, 5.4 percent reported use of synthetic cannabinoids in 2014, 4.3 percent in 2015, 3.3 percent in 2016, and 2.7 percent in 2017. For 12th graders, 5.8% reported use of synthetic cannabinoids in 2014, 5.2 percent in 2015, 3.5 percent in 2016, and 3.7 percent in 2017. Thus, despite widespread reporting in the media regarding use of synthetic cannabinoids recently, the data suggests that use of these drugs has significantly declined among younger individuals in recent years. This decline most likely reflects controls placed by the states and federal government on the substances in combination with educational attempts to provide the public with information regarding the potential dangers of these substances. Overall, use of synthetic cannabinoids is relatively rare compared to most other drugs despite significant media attention to cases of overdose, poisoning, and intoxication on these drugs. Reliable specific statistics that show use of these drugs by region in the United States are not readily available, but there is information regarding poisoning admissions associated with these drugs. 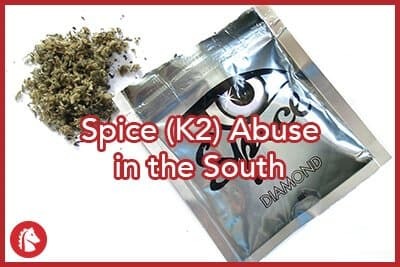 The Centers for Disease Control and Prevention (CDC) reports the latest data regarding reported poisoning cases associated with synthetic cannabinoids like K2 and Spice. The latest available data is for 2010 to 2015. As can be seen on the CDC’s website, the highest rates of poisoning occurred in the Northeast, and reported poisoning cases in the South are significantly lower than most other areas of the country. According to the CDC, during the 2010-2015 time period, there were a total of 456 cases of reported synthetic cannabinoid intoxication treated in the United States and 61 percent of these were solely due to the use of synthetic cannabinoids. The other cases were due to a mixture of synthetic cannabinoids and other drugs. There were three deaths recorded, one resulting from the use of synthetic cannabinoids alone and the others as a result of mixing synthetic cannabinoids with other drugs. About 71 percent of the cases of synthetic cannabinoid intoxication occurred in people between the ages of 19 and 65, and approximately 27 percent occurred in people between the ages of 13 and 18. Slightly over 83 percent of the cases were male. Recent stories in the media suggest rising levels of toxic reactions and overdoses occurring in numerous areas of the country, particularly in urban areas and primarily to homeless individuals. Again, the presentation of the stories in the media may lead to the impression that use of these drugs is rampant in the South and across the country; however, recent statistics by organizations such as NIDA and the CDC suggest that this is not the case. Instead, the efforts to control the distribution of the substances by governmental organization has resulted in even more dangerous chemicals being put in synthetic cannabinoids in an effort to provide a legal product. Continued monitoring of these substances by the government, educational entities, and law enforcement can be effective in reducing rates of toxic reactions to and overdoses on these drugs. These drugs are extremely potent and unpredictable. The toxic effects of these drugs include a combination of psychiatric, neurological, and other effects that can vary from individual to individual. Moreover, there are numerous examples of individuals becoming severely psychotic and disoriented as a result of being under the influence of these drugs. While Spice use does appear to be most prevalent in the Northeast, based on poisoning data, there are reports of use among college students in the South. A 2010 study involved over 3,000 students from 11 colleges in North Carolina and Virginia. Participants were assessed when they entered college regarding their use of Spice. At entry, 7.6 percent reported lifetime use of Spice or K2. By their fourth year of college, 17 percent reported lifetime use of the drug. College often represents a time of increased experimentation with substances. Easier access to synthetic drugs as well as peer pressure likely contribute to this uptick in use. As a result, many colleges across the South have increased prevention and education efforts when it comes to synthetic drugs like Spice or K2. The terms substance abuse, substance dependence, and addiction are often used by the general public: however, the clinical designation for addictive behaviors that occur as a result of the use of some drug is a substance use disorder. This term combines all the older notions of abuse, dependence, and addiction with the expanding research on addictive behaviors, which has indicated that these are not separate conditions; instead, they are related conditions that occur on a continuum. Substance use disorders are diagnosed as a result of an individual’s behavior; there are no laboratory tests, brain scans, or other medical tests that can definitively diagnose a substance use disorder in anyone. The clinical severity of an individual’s substance use disorder is determined by the number of symptoms they display. Substance use disorders have specific diagnostic criteria that must be met in order for a formal diagnosis to be made. This formal diagnosis can only be made by a licensed mental health clinician, although individuals close to the person with the problem will often recognize many of the general indicators of a substance use disorder and express concern. Getting someone treatment for a substance use disorder can be a very complicated issue, especially if the person is not convinced they need help. NIDA lists the general effective components of treatment for substance use disorders.